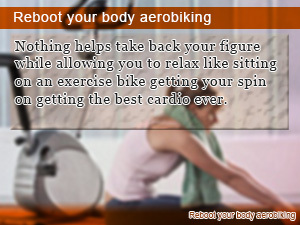 Spinning workouts such as indoor cycling and aerobiking do wonders for your legs. That is just to say you can get the same workout as you would at doors at home or at the gym. Indoor cycling exercise is a workout gem for training your legs to get more work done in less time. 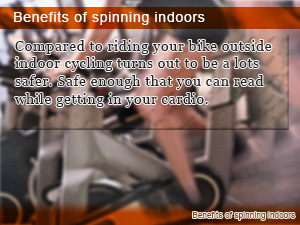 Although often referred to as spinning or aerobiking, all it's just cycling indoors. Spinning workout and bike training are some of the simplest exercises around. You would be crazy not to give it a try. Is indoor cycling good for weight loss to get in shape? There are many times when exercising indoors is a thing of the weather. Although you may want to tread through the storming rain on your bike riding the trails on some days, when you want to stay as dry as possible taking up Indoor Cycling may be the best bet to get your bike training exercise done without pulling a cold. Indoor cycling exercises such as spinning workouts and aerobike exercise make it possible to get anaerobic exercise getting in your cardio on days when the weather dictates you stay inside. While being relatively easy on your body, bike exercise also gives you a great lower body workout burning fat while listening to music or watching your favorite show. In this daily Slism, we will take on indoor cycling such as spinning workouts, bike training, and aerobiking as leg exercise to get in shape with anaerobic exercise cardio, benefits of indoor cycling, and some things you should know before getting an exercise bike for your home. Sometimes it is hard to get your mind of areas of excess flab forming around your lower extremities causing your hips and legs to swell up. In particular, gaining weight in your thighs makes it much harder to put on short pants not to mention a skirt, limiting the style of clothes you are able to wear. The diet and exercise method you have been looking for to restore your beauty starting with your legs may be indoor cycling. Just by peddling can you get in shape doing bike exercise? Although the results you get from training on a bike are not short of superb, the real benefit you get out of indoor aerobiking comes from anaerobic cardiovascular exercise. Exercise bikes can be adjusted to fit your height so you can jump on and start peddling without feeling cramp because of your physical disposition. The burden you put on yourself, peddling through the scene as your focus in on your favorite playlist or show quickly turns into calories burnt not to mention a great way to train your legs to make progress in fitness from the bottom up. Getting Started With Indoor Cycling Is Easy! Exercise bikes can be bought for cheap used or run a pretty penny if you are ready to buy new. The types that of indoor cycling bikes from best to worst can often be evaluated by price. If you are unsure of whether or not it is you want to actually go out and by a spinner for home give on a try at the fitness gym nearest to you. The advantage of buying a bike to use in the comfort of your home is that not only can you enjoy the benefits of indoor cycling without leaving your home; it pays for itself as you continue to use it. If you are paying for a gym membership just to ride the exercise bike, then this is a sure sign to start thinking about getting one for your house. The disadvantage of not going to the gym for ride the bike is of course the group exercise experience. Studies show that people perform better in groups in order to conform especially in exercise. Going to a fitness gym and joining a spinning class may be your best bet to push it to the next level. Bikes exercises such as indoor cycling, spinning, and aerobiking and other great cardio workout that resemble riding your bike make it easy to exercise your legs with minimum burden on your joints. That is why in terms of exercise that you can do at your own pace not being pushed around by your diet, indoor cycling should be number on your list. 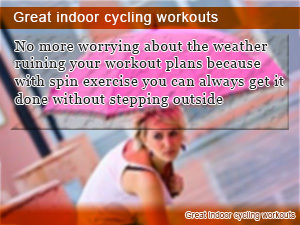 Indoor cycling and aerobiking make better use of your time. Unlike trail riding and cycling on the open road you don't have to waste any time waiting for the lights to change or people to pass by on the go. Even though cycling may not be the best choice for getting a rise in your mood on a warm sunny day, it always makes a good scapegoat when there is likely no other choice because of the weather. Aerobiking is safe. That means you can let go of the handlebars and even read a book or watch a show while you are at it. Either way, there is no need to worry about something jumping out. By doing indoor cycling exercise you build muscle strength in your legs that can alleviate areas in lower extremities from impeded circulation programs making your heart work unnecessarily harder than normal. A common symptom of this condition are chills and potential swelling in your legs that could lead to edema and even cellulite if left untreated for long periods of time. Aerobiking helps relieve this. In addition to improving the overall circulation in your body, spinning helps raise your core temperature, which can help you burn fat and boosts your metabolism. The best part about spinning and aerobiking is that it is easy. That doesn't mean you have to forget about other ways besides indoor cycling to get a lower body workout putting in time for cardio. Getting an exercise bike for aerobiking at home doesn't come without paying the price and that price is most notably space. If you don't live in a studio apartment or are a home owner, chances are that you can afford to put a spin bike in your living room without blocking the view from your couch to your television with ease. On the other hand for the rest of us, finding enough space to store an exercise bike during the day when not exercise may prone to be a big problem. Do whatever is convenient, whether that is getting a smaller more compact exercise bike or investing in a gym member ship with bikes that you can use. Take your body back by the handle bars. Learn how to turn your bike into a fat burning exercise machine that will make your wife happy and takes you to work everyday. No need to go out to climb steps anymore! Stepper exercise with a mini stepper gives you step climbing that you can do at home whether you have stairs or not. Compared to riding your bike outside indoor cycling turns out to be a lots safer. Safe enough that you can read while getting in your cardio. Nothing helps take back your figure while allowing you to relax like sitting on an exercise bike getting your spin on getting the best cardio ever.